The Twinkling Tricycle took the Tour to the FOX 8 Morning Show studio in Cleveland, OH. Wayne Dawson and Stefani Schaefer took delight at the mobile sparkling machine. Wayne even went for a short spin on the trike commenting on its smooth performance. Cleveland Magazine posted on their blog about the Twinkling Tricycle Tour of Enchantment. Roxanna Coldiron interviewed me about the Twinkling Trike’s appearance at Brite Winter this Saturday, February 16, 2013. During the Friday Euclid corridor Twinkling Tricycle ride, photographer Joshua Gunter of the Plain Dealer followed along snapping some great photos. One photograph appeared on page B12 of the Sunday Plain Dealer Metro Section. Mr. Gunter braved the cold leap-frogging ahead to get the twinkling images. More of his tricycle photos can be seen in an online gallery on Cleveland.com. Thanks for coming along for the tour Josh. Gunter, Joshua. 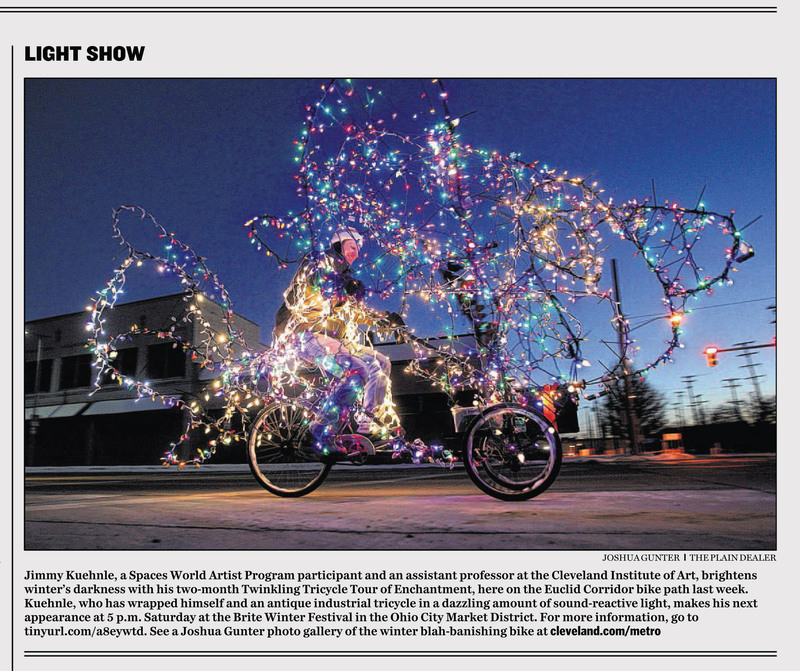 “Light Show.” The Plain Dealer. 10 February 2013. B12. Steven Litt of the Cleveland Plain Dealer stopped by the Sculpture Center to see Justin Braun’s and my show. He published a review in this Friday’s paper about the Sculpture Center shows and my SWAP residency at SPACES. Litt, Steven. “It’s a work that makes you work – with balloons.” The Plain Dealer. 8 February 2013. T16. Link to online version with more images and a different title. On the Twinkling Tricycle Tour of Enchantment Euclid Corridor ride, I passed by the Channel 5 newsroom. They sent out a news van to catch up with me. The lights protected me from traffic but the camera man should have had a reflective vest for nighttime shooting. Lots of motorists stopped to take pictures, workers in building came streaming out into the streets, bus passengers remained glued to the windows. The night twinkled with Enchantment. Two more tour dates remain. Jimmy makes an appearance at the Brite Winter Festival in the Ohio City Market District. Friday, February 22, 6:30 p.m. I want you to check out this unusual site in downtown Cleveland. Isn’t this something. We caught up with Jimmy Kuehnle riding his decorative bike down Euclid Avenue. We all saw him from the newsroom tonight as he came by. It’s called the Twinkling Tricycle Tour that is part of a SPACES gallery exhibit. Jimmy is an assistant professor at the Cleveland Institute of Art. And he says that he designed the bike himself. He has 3000 Christmas lights on it and you just can’t miss him. You can’t miss that going down the street. The Twinkling Tricycle Tour of Enchantment crossed the Carnegie Bridge in Cleveland, Ohio on the way to SPACES. Rob Muller, a photographer for the Cleveland Institute of Art, snapped a great panoramic image of the Twinkling three-wheeled transport. Jimmy makes a round trip ride down the Euclid Corridor bike path, from Euclid and East Boulevard to Cleveland State University. Bright colors spilled out onto Euclid Avenue from the Sculpture Center as The Inflatable Wonderland Labyrinth of Joy inflated for the first time. Not much space for anything else in the gallery. The show opens this Friday, January 18th at 5:30 – 8:00 pm and also features a show by Justin Farris Braun called The Swelling Horizon. Normally I prefer to make funky bicycles for performance projects such as the Four Person Bicycle made at Sculpture Space. 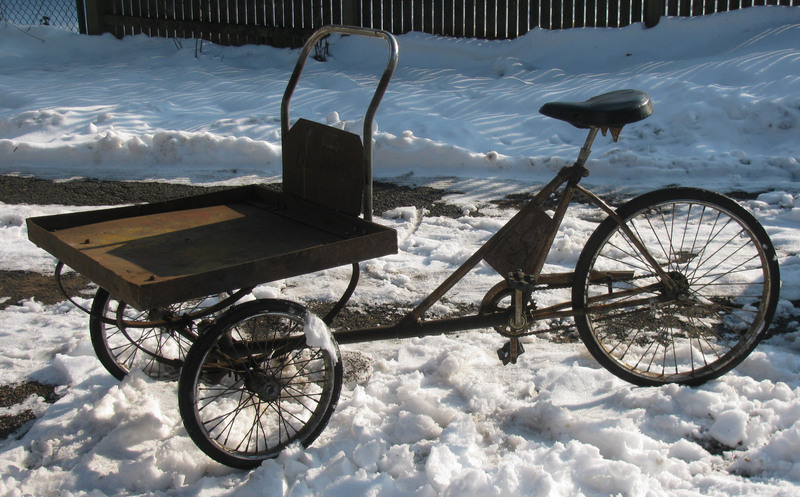 I could not pass up this old Worksman Industrial Tricycle that I found on Craigslist. The seller claims it came from a plant in Indiana. The front loading tray has “die cutters” written with welded beads. SPACES, an exhibition space in Cleveland, Ohio, has a SPACES World Artist Residency Program or SWAP “is a residency program for international, U.S. and local artists, founded in 2002 to foster cultural exchange between audiences in Northeast Ohio and artists from around the world.” I am a current SWAP resident with an exhibition opening at SPACES on February 1, 2013. For the project I am constructing a device that exchanges sound for light. It will be built on the platform of the Worksman Tricycle giving an old rusty relic some new life. The device will tour around Cuyahoga County at various locations during the month of February. My Inflatable Wonderland Labyrinth of Joy, currently under construction, will open in the Euclid Avenue Gallery. Justin Farris Braun’s show The Swelling Horizon opens the same day in the Main Gallery. See his work at www.justinfarrisbraun.com.